For some, retirement is a welcome chance to quit working forever, but for others it can mark the beginning of a new and exciting venture. 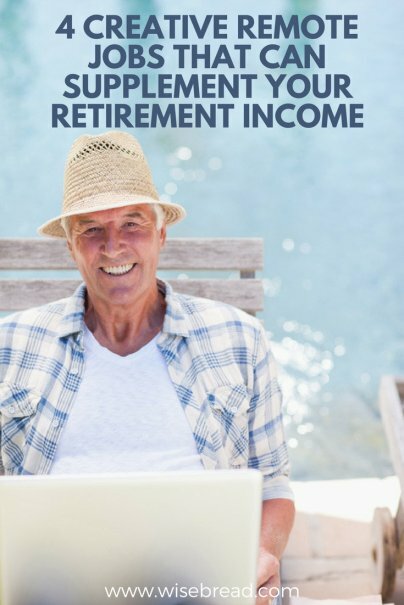 It could be out of necessity to supplement a smaller retirement income, or a desire to keep yourself busy with a foot in the working world. Either way, earning money in retirement is an option that plenty of people take, and thanks to the internet, there are jobs that can be done from anywhere in the world. This is especially true for people who have a creative streak. If you're on the lookout for a way to pull in a few dollars using your word or design skills, without stepping foot in an office, here are four remote jobs that can bring in some extra cash. It takes minutes to set up a blog, and once you have the basics in place, you can begin creating your very own online kingdom. Start out with your friends and family and ask them to share your content with their friends and family to give your blog a boost. The top bloggers on the internet earn six-figure salaries, though clearly not everyone will reach this level. It's not unrealistic to be able to rake in a few hundred dollars per month once your site is established. Virtually any written text has the potential to require editing, and these days it's far more likely to be done online than with a pen and paper. If you're a stickler for grammar, efficient at fact checking, and can quickly and accurately knock a piece of text into shape, then you could try your hand at editing. To become a good editor, you should be able to provide objective and useful feedback to help writers improve their work, without being condescending or unnecessarily critical. There are many places to find editing work online, which will vary depending on the type of content you're working on. Online job marketplaces such as Upwork and Freelancer are good places to start, and allow you to search for and submit proposals for jobs that appeal to you. There are also sites commonly referred to as "content mills" that might not offer high-paying projects, but can be relatively easy to get regular work from as a beginner. Sites such as CopyPress, allow you to go through their training program and earn a certification with them for copy editing, which you can then use to get jobs through the site. If you have a way with words and love to share your experiences, freelance writing can provide a great way to supplement your income. There are countless forms of freelance writing, from copywriting to technical writing, so the first step is to find one that suits you. This is different from blogging, in that you'll be writing for other publications, and some assignments may be in print, as opposed to exclusively writing for the web (though there are still endless opportunities to find work creating digital content). It's best to start off with an existing area of expertise that you possess, or something you're passionate about, and then you can expand your repertoire from there. Many online publications have sections that detail how to make submissions directly to them, as well as information on exactly what they are looking for and how they want it presented. As with freelance writing, online job sites are often a good place to start your search. If you have publications in mind that you'd like to write for, then you can also approach them directly with a pitch. I recently met a retired woman from the U.S. who had been working her way around South and Central America for over seven years. She told me that though her retirement income was enough to support a basic lifestyle, she liked to supplement it by doing extra work along the way. Her part-time hustle was designing websites, a skill she'd taught herself in her free time when she retired. Whenever she turned up in a new location, she would head out to the local hotels to canvas for work designing or redesigning their sites. Over the time she'd been traveling, she'd built up a good portfolio and found it quite easy to pick up new clients. Because it's all done online, you can find plenty of web design work that can be done remotely. Web designers can earn up to around $100 per hour, though the average stands at about $59 and it could be $40 at the lower end. Most websites, particularly for physical businesses, are small and uncomplicated, so even with lower end web design skills, it's possible to create great sites that clients will be happy with. If this is an area you have expertise in, then you can also branch out into bigger projects, but it is still possible to be self-taught and find work.